"They go in with guns into hospitals," said the resident, identified only as Adel to protect his safety. "They take the bodies that are dead. In some hospitals, they have shot the wounded. This is true. I know it's very strange for the States, but this is happening today in Tripoli." Because the situation in Libya is growing more dangerous day by day and reporting from the country is difficult for Western journalists, the statements Adel made to CBS Radio News could not be independently verified. In one example of the violence in Libya, Adel said he saw 62 protesters killed and about 100 more wounded in Tripoli's Green Square Tuesday. "They're putting the bodies on half pickup trucks, and they're taking them somewhere we don't know yet because they don't want these bodies to go into hospitals," Adel said. That's not the only action being taken to cover up what is happening in the capital, Adel said. Armed pro-government supporters Thursday were forcing people to help clean up parts of downtown Tripoli and paint buildings. "There are some streets where he's using the people in the houses; if they don't go out, he will shoot them with gunpoint to do that," Adel said. What the protesters want most from the international community is the establishment of a no-fly zone over Libya, Adel said. "The guys are using helicopter gun ships to shoot people, shooting not bombing," Adel said. "It is terrifying. It takes a lot of pushing your guts to go out, but you have to." 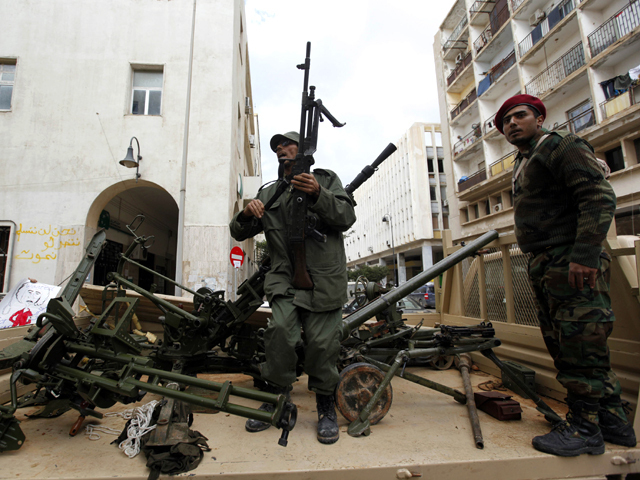 The situation in Tripoli continues to deteriorate, Adel said. Because shops are running low on basic supplies, lines more than 1,000 yards long form outside bakeries that do have food to sell. "It's very unsafe," Adel said. "They have cars where mercenaries are shooting at random. Trying to keep a low profile, only at night do we move out to do the demonstrations." One thing protesters reportedly face is so-called thugs being flown in from other countries. Adel said he noticed increased activity at the air base near where he lives. "The amount of planes that are coming in are tremendous," Adel said. "They're flying them through ... and taking helicopters around to other places around Tripoli. Most are Africans." Also, the so-called "hallucination pills" that Qaddafi mentioned in a rambling speech Tuesday are being handed out during protests, Adel said. However, they aren't being distributed by foreign instigators, as Qaddafi said, but by the leader's own supporters. "His people are giving them for free," Adel said. "Not to the demonstrators against him, to anybody who wants to take them or his people or the drunks or the thugs."